This area rug is perfect. It has held up against much foot traffic as well as my dogs. It is still in great shape and holds its colors fantastically. The area rug still looks new. 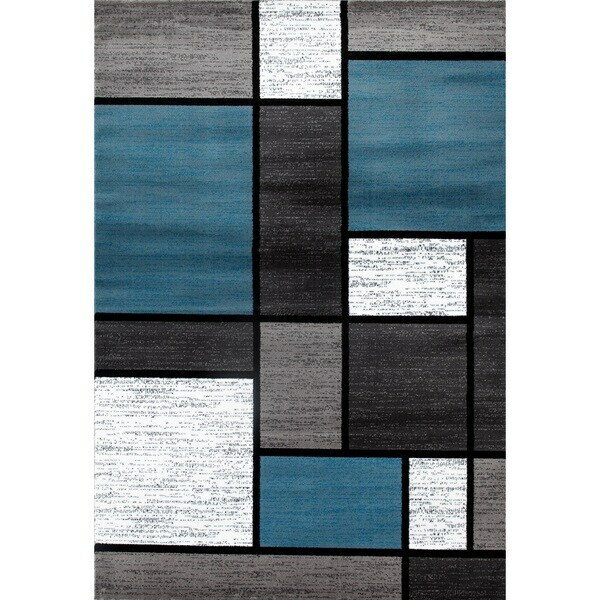 Accentuate your study or living room with the clean, contemporary design of this area rug. Made of stain-resistant materials, this rug features a modern geometric design in grey and black with vivid blue highlights. Beautiful rug and could not be pleased more. Great colors and great quality. The color look nice and the rug is beautiful. love this rug, the colors are so perfect! I would order this again! I live in a motor home and am upgrading the interior. This rug pattern and color combination has had an amazing impact at brightening and modernizing my living space. Look, you can't go wrong with Overstock. It would take you years to find and travel to all the brick and mortar stores to search all their inventories that Overstock has at your fingertips. You can do it here at your leisure. I love it,I bought to match my big area rug,love the colors. Great rug that is solid made and has bright and vibrant colors. Would recommend this runner but need to purchase a rubber backing. The blue is lighter than I had hoped, but they are still pretty. Rug colors are exactly like the picture and if you use the magnifier you'll see it's dappled...beautiful and picks up the accent colors perfectly. "Need a royal. Do not want a sky blue or turquoise. Please clarify the blue color"
This is more like Teal Blue. I hope it helps. "Is this a dark blue? " To match the area rug and runner already purchased. We recommend spot cleaning with a damp rag for spots and stains, but professional cleaning is best for long term cleaning.